Edit the attributes in the enemy’s profile property list. 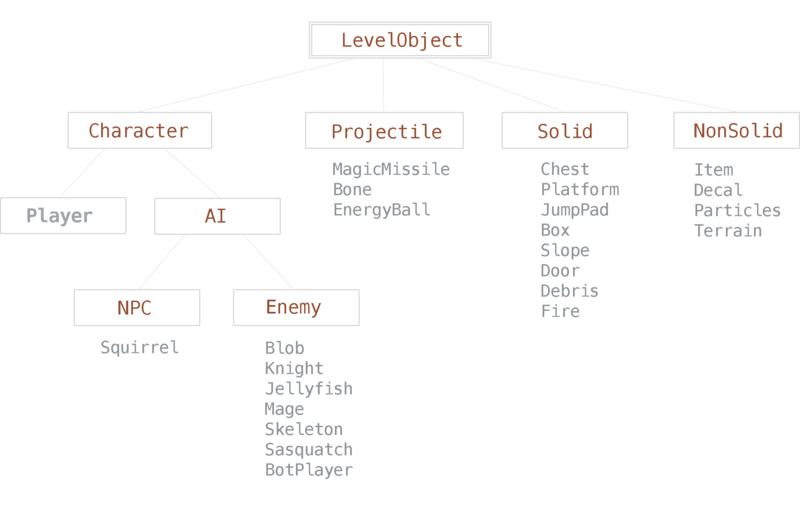 Example: Assets/Profiles/Blob.plist > attributes > hp = 5. Add a tmx object property. Example: set hp property to 5 in the tmx file. Hops around randomly, clinging to walls and ceilings. Deals light damage and has low health. Jukes back and forth, every once in awhile firing a Bone projectile in an arc toward the player. Low hitpoints, medium damage. A miniboss. A statue that comes to life and jumps towards the player, shaking the screen. High hit points, high damage. Use the tmx object property flip-x or flip-y (boolean 1 or true) to flip the initial sprite. An AI-controlled player. Used in networked multiplayer when a human player cannot be found. Has the same abilities and attributes as a default player. Hangs on the ceiling and swoops down at the player. Low health, low damage. Teleports around the level, firing MagicBall projectiles at the player. Medium health, medium damage. A boss. Jumps and slams the ground, dealing a shockwave of explosions. Roars, beats chest, shakes the screen. High health, high damage. Note: Sasquatch is not finished yet. Coming in the next release.